Our screening committee watched over 1,300 films from 48 countries to select the final 135 films for your enjoyment. The key to enjoying DC Shorts is to get involved — watch film trailers, read film descriptions, interact with filmmakers — then check the schedule of 98 screenings with your calendar. All 17 Showcases consist of 7-9 films that vary 2 minutes and 29 minutes in length. The showcases are like a delicious tapas platter — a sampling of the top short films from around the world. You will see comedies, dramas, animation, documentaries, experimental films, thrillers and even musicals from filmmakers as close as the District and as far away as Australia. All showcases are approximately 90 minutes in length. All foreign language films are subtitled. The ticket price covers all of the films in a single showcase. On opening weekend, all of the Showcases are followed by a moderated Question and Answer session. You are encouraged to ask filmmakers about their films, their inspiration, the creative decisions behind them, and any other aspects of their craft. Audience members who stay for the Q&A sessions are rewarded with a greater experience — and a special offer. The Parties allow you to interact with visiting filmmakers and fellow audience members. Nibble on scrumptious bites, enjoy custom cocktails, beer and wine, and dance to DJs and live bands. A separate ticket is needed to attend the parties. On Friday, September 19, we present the DC Shorts Screenplay Competition, where six writers will present their short scripts, performed by local actors, to an enthusiastic audience. After the presentation, audience members vote on their favorite script, and that writer wins $2,000 to shoot a film, which we will show at DC Shorts 2015. 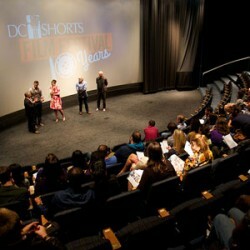 DC Shorts concludes with multiple screenings of The Best of DC Shorts. In addition to jury prizes, we also screen the Audience Favorites as polled during the opening weekend. There are two different Best Of shows, each with a unique set of films — a separate ticket is needed for each show. Throughout the week, there are also free events. The Family Showcase (70 minutes) screens films appropriate for children ages 8+. We also offer Free Lunch Shows (40 minutes) at two theaters. These shows are designed for you to pick up lunch, watch a few films — and take a break from your workday. And if you want to see more films in the comfort of your home, there is the DC Shorts Online Film Festival. Over 100 of our films are available to watch online through this website. The ticket price for the Online Festival gives you access to all of these films through the end of the festival. We look forward to seeing you September 11–21 at one of our three locations throughout the metropolitan area.